The ability of the Tumbler Ridge area to keep on delivering new discoveries each year is remarkable. If there were any doubts on this score the Golden Summer of 2014 dispels them. the repatriation of a prehistoric bison skull to Tumbler Ridge – it is awaiting a First Nations blessing ceremony before being exhibited. Kevin Sharman discovered a new type of marine reptile – it awaits study and description by palaeontologists at the University of Calgary. Richard McCrea and Lisa Buckley, while prospecting for fossil fishes, made exciting fossil crustacean discoveries – in this case the studies will be done in collaboration with scientists from University of Alberta. Rich and Lisa also continued their important work making replicas of dinosaur trackways discovered in 2013 on vertical rock surfaces in Dinosaur Gorge – more publications and new exhibits can be expected. A tip by First Nations led to the identification of enormous fossil clams, creating another exciting project for 2015. Yet another trackway discovery was made in another previously unexplored creek, this time yielding what are probably large bird tracks – again, a replica has been made, research is in progress, and a scientific paper can be expected, followed by a new exhibit in the Dinosaur Discovery Gallery. New cave entrances have been found, some of which have now been explored, others which still await a first descent on rope. A spectacular rock area featuring paleo-potholes and fossil river channels that sculpt the bedrock into amazingly beautiful, bizarre shapes. An unexpectedly impressive new waterfall, Triple Jump Falls, set in conglomerate rock, and already made famous by the drone photography of Brandon Braam. Throw in the hard work of the Wolverine Nordic and Mountain Society volunteers in developing the TR Trail, board-walking the meadows to Babcock Falls, and installing signage and otherwise enhancing the trail system that leads to forty geosites in the area. In September I had the privilege of giving a power point presentation, on what was then still the Tumbler Ridge Aspiring Geopark, at the UNESCO conference in Stonehammer to 500 delegates from 30 countries. I showed them pictures of these discoveries. 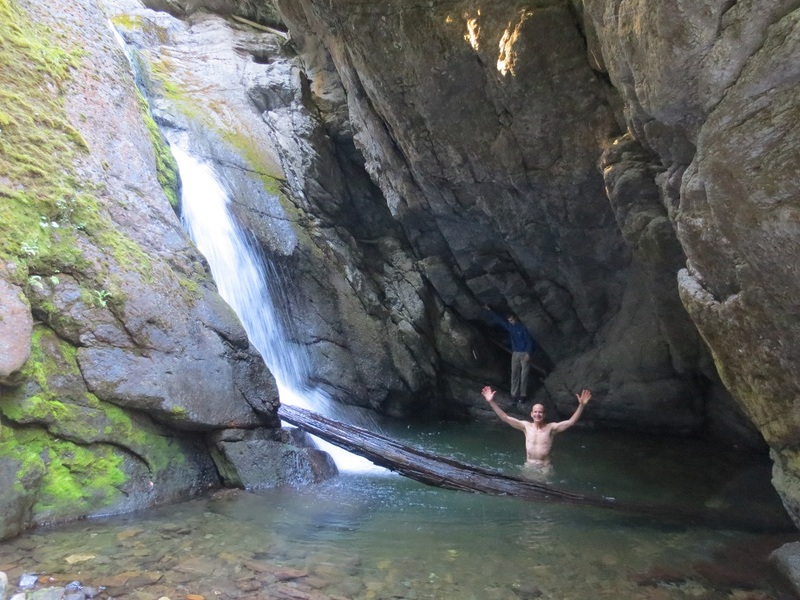 When I pointed out that all this had happened in the three months after the Global Geoparks Network had sent their evaluation mission to Tumbler Ridge in June, there was a gasp of disbelief. I don’t think there is anywhere else on the planet where there is such a rate of discovery, yielding documentation, scientific publication, and interpretation and exhibition in such a short space of time. There are many things which make us unique, but perhaps this phenomenon of ongoing exploration and discovery, and the excitement and passion it generates, is the most important of all. Another gasp was elicited by the slide of our MLA, Mike Bernier, on rope assisting Rich and Lisa in Dinosaur Gorge – such concrete evidence of political support and involvement is clearly globally rare. And topping off this Golden Summer, of course, was the admission of the Tumbler Ridge Global Geopark into the Global Geoparks Network. We joined 110 others with this distinction, as just the second in North America and the first in the west. It was just reward for an incredibly hard-working, dedicated committee of volunteers and scientific advisors over the preceding 23 months, and justification to those who had the vision and foresight to fund the project (Peace River Regional District, District of Tumbler Ridge, Province of BC). Where does this spate of discoveries leave us? Firstly, with an incredibly exciting 2015 to look forward to, as these findings are analysed, and these sites are revisited and explored in further detail, probably creating a ripple effect of further discovery. Secondly, with an almost overwhelming feeling of fortune and privilege to be in a place that delivers such riches. Thirdly, with a responsibility to try to do justice to these treasures, to ensure that they become known to and cherished by all British Columbians, and all who choose to visit our Global Geopark. And fourthly, to continue seeking the sustainable funding that will enable all of this. In a time of great economic hardship for Tumbler Ridge, we need to count our blessings and use them wisely. The Golden Years of exploration and discovery in Tumbler Ridge do not exist in some remote past era. They are with us today, and that makes us unique. Our rocks are truly the gift that keeps giving.